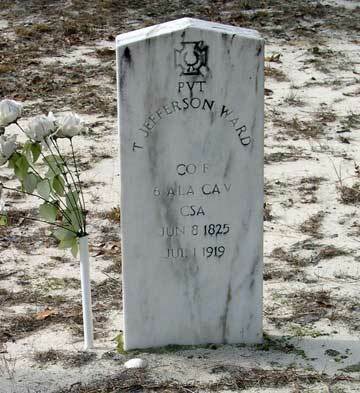 Thomas Jefferson Ward was born on June 8, 1825 in Dale County, Alabama and died on July 1, 1919 in Bruce, Florida. He lived to be 94 years old. Family #460: Thomas J. 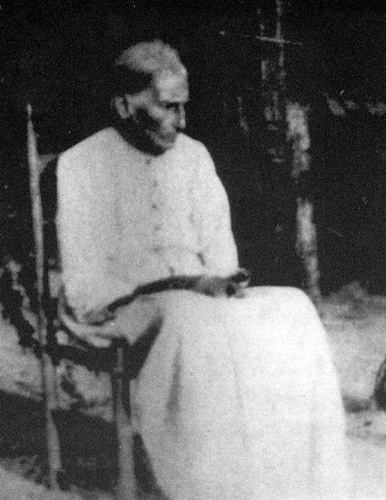 Ward (age 34), Hallana (age 33), Mary J. (age 2), James C. (age 4 months). Thomas is a farmer and he was born in AL. Hallana was born in GA. All of the children were born in in AL. Family #69: T.J. Ward (age 55), Hollan (wife, age 54), Thomas J. (son 18), Jessee B. (son, age 14), Sarah E. (daughter, age 12). T.J. was born in AL and his parents in SC. Hollan was born in GA, her father in GA and her mother in SC. The oldest child was born in AL and the rest in FL. T.J. is a farmer, Thomas J. is a laborer and Jessee is working on the family farm. The two oldest boys have been attending school. Hollan cannot read or write. The families of W.J. & A.B. Ward, John & Emma Ward, Jack & Susan Ward, and T.F. and Wat Ward live in the same area. family#17 -John D Faircloth (26-2/1874-GA)-farmer, Ella Faircloth (20-4/1880/FL), Eva Faircloth (0-6/1900-FL)& border-Thomas J. Ward (74-6/1825)Thomas is a widow, born in FL, parents in SC, his occupation is a Oysterman. Antioch Cemetery: Thomas Jefferson Ward, born 6/8/1825 and died 7/1/1907. It says PVT Co. F6 Alabama Inf. CSA on his tombstone. Others in the same plot are James Monroe Ward and James Madison Ward. Click on any of the News, Events, or Discoveries buttons above to see historical things that happened during Thomas Ward's life. These are only some of the major events that affected the life and times of Thomas, his family, and friends. For example, Thomas is 5 years old when Indian Removal Act signed and the moving of eastern Indians west of the Mississippi begins. 10 1835 Alabama gold rush begins in the east-centrl hill country. 12 1837 The Second Creek war begins in 1836. In 1837 The Battle of Hobdy's Bridge becomes the last indian battle in AL. 15 1840 Alabama reports a total population of 590,756 on the 1940 Federal Census. This includes 335,185 whites, 255,571 blacks, 253,532 slaves, zero Native Americans, and others. 25 1850 State population=771,623. The 1850 Federal Census reveals the White population=426,514; African-American population=345,109; Slave population=342,844; Free black population=2,265; Urban population=35,179; Rural population=736,444; Cotton production in bales=564,429; Corn production in bushels=28,754,048; Number of manufacturing establishments=1,026. 81 1906 An attempt to drain the Everglades and convert it to farmland begins. 92 1917 Seminole Indians become a Florida tourist attraction. 87 1912 The unsinkable Titanic sinks on its first trip to New York drowning 1,513 people. 87 1912 White residents of Forsyth County, GA, drive the black population out. 92 1917 NEWS HEADLINES: In June, the United States enters World War I on the side of the allies. The Russian Revolution ends the reign of the czars and thrusts Russia into communism. 94 1919 NEWS HEADLINES: World War I ends with the signing of The Versailles Treaty. 85 1910 Boy Scout and Girl Scout Organizations are introduced in America and the concept of a "week end" meaning time off from regular work begins to take root. The British Empire covers 1/5th of the world land area. 89 1914 World War I - Following the crisis touched off by the assassination of Archduke Ferdinand of Austria in Sarajevo, Germany declared war on Russia and additional countries joined the war within several days. 92 1917 Germany uses airplanes to drop bombs in the early stages of World War I -- the first major military use of airplanes. 94 1919 The Versailles Treaty marks the official end of World War I. Born about 1825 and died about 1888. Born in Dale City, Alabama on November 8, 1852 and died in Panama City, Florida on December 4, 1936. She was 84 years old. 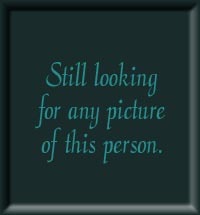 Born in Geneva Co., Alabama on April 10, 1855 and died in Holmes Co., Florida on July 3, 1886. He was 31 years old. Born in Dale Co., Alabama on March 17, 1856 and died in an unknown location on October 6, 1949. She was 93 years old. Born in Dale County, Alabama on January 25, 1862 and died in Holmes County, Florida on December 18, 1901. He was about 39 years old.